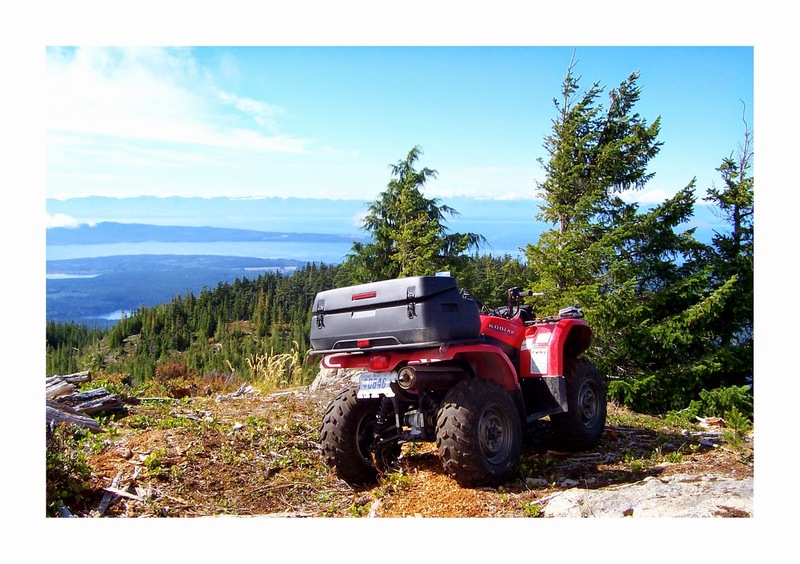 Fall is a good time to go quad riding in the Powell River back country. We used a recent cool, sunny day to head out in our barge. With short days we couldn't go far and still have enough sunlight to ride, so we chose nearby Goat Island. From our float cabin home base, it takes about forty-five minutes. There was no logging activity, so we could use the Western Forest Products barge ramp and dock. I hovered offshore while Wayne prepared the bikes for offload. This time of year there's a lot of activity on the lake with the fall hunting season open. 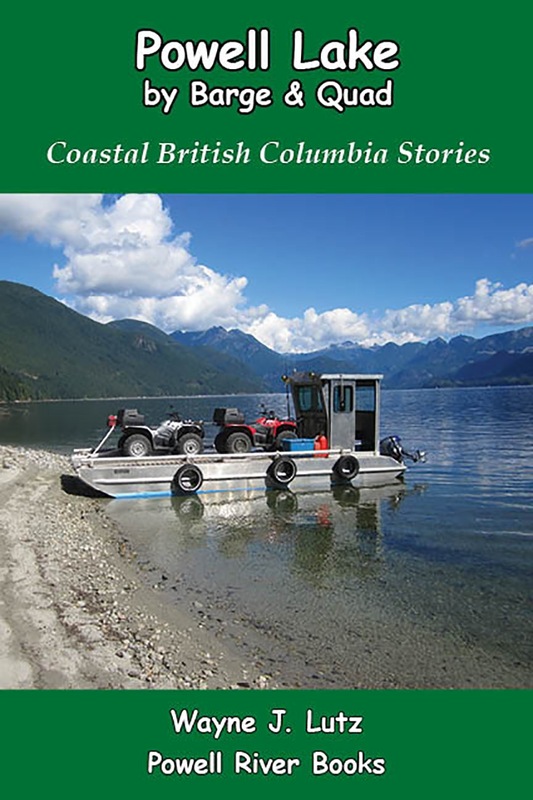 We've seen people taking their quads and motorcycles up on landing crafts, barges, decks of houseboats, home-built barges and rafts, and squeezed into regular boats. It's a good reminder to wear bright colours and keep your eyes and ears open. The first leg of our journey took us north on Clover Main. We've traveled this section of road before, but not to the end. Along the way we stopped at the quad trail heading down to the mouth of Clover Lake. It's a good road, but we decided to hike down. Bad move with all the runoff and muddy puddles. We'll know better for next time. But we did discover why they call it Clover Lake, lots of clover growing in the area. As we progressed north, the road went from active to not used in many, many years. 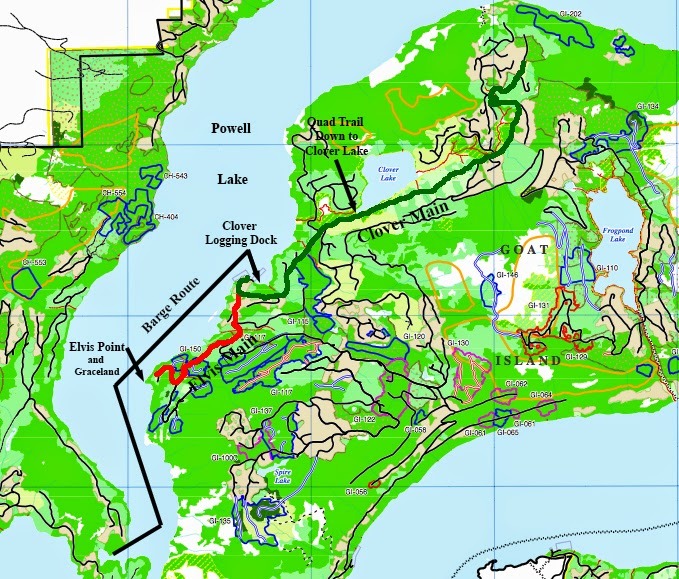 We retraced our steps at the ends of spurs, and continued as far as the alders, cedars and firs in the roadbed would allow us to travel. I think the old roads are really pretty to ride. This logging road hasn't been used for quite some time, and is being quickly overgrown. But we were able to wind our way around trees and bushes to make it to the end of the road.